The video above shows the process of rhino dehorning and includes explanations from Dr Mike Toft and David Gilroy. 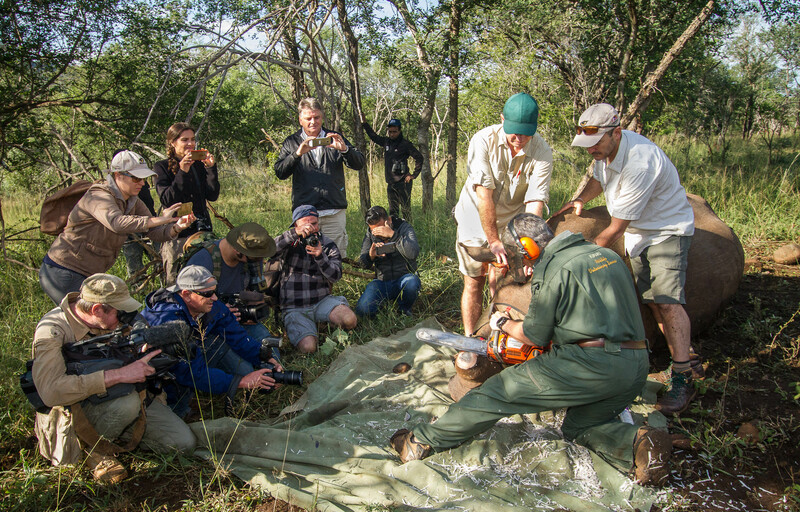 The Project Rhino team dehorning a white rhino. In the lush Somkhanda Game Reserve, between the far removed towns of Mkuzi and Pongola in Kwa-Zulu Natal (KZN), is a group of ten to 12 South Africans who have put everything aside to protect the rhino, devoting their lives to conservation and rhino protection. Project Rhino, an association of like-minded conservation organisations was founded in 2011 and is dedicated to protecting rhino and preventing wildlife crime. Key members of the organisation emphasised the need for partnership and greater strategic understanding to save these animals. “For those on the frontline, protecting rhinos is no longer a conservation challenge: it’s a war,” said Xolani Nicholus Funda, chief ranger at Kruger National Park. Over the past decade, more than 7,000 rhinos have been killed in South Africa, threatening the existence of the endangered species. The rhino-poaching crisis is compounded by corruption and a lack of coordination amongst government and law-enforcement groups in the country. Kruger National Park is the largest game reserve in South Africa and is approximately two million hectares. Home to 9,000 rhino, the park has become a hotspot for poaching where on average two to three rhinos are killed every day. The number of rhinos poached each year has dropped from a high of 1, 215 in 2014 to 769 in 2018, however, a small decrease in numbers does not make up for the imminent threat of extinction. Somkhanda, similarly to Kruger National Park, is home to the Big 5 and is one of South Africa’s most sought-after tourist attractions. It, alongside Kruger and all the other national parks in the country, is under constant threat. Rhino horn has become the world’s most valuable appendage in exotic marketplaces that value nature’s oddities. It differs from other animal horns, as it is not made of bone but of keratin, the protein found in human hair and fingernails. Like our fingernails, if you cut a rhino’s horn it grows back. Rhino horn is used in traditional Chinese medicine and is increasingly being used as a status symbol representing wealth and success. The horn is highly prized and is valued more than the price of gold or cocaine. Anti-poaching campaigners have started to resort to the drastic approach of dehorning these animals in an attempt to stop poachers. “Dehorning is expensive and invasive but it is a necessary evil. We believe that dehorning disincentives poachers. It is not something we like to do but we have taken this proactive stance as a temporary measure, which gives us more time to work on other important systems that are used to protect our rhino,” explained head of Project Rhino Chris Galliers. In May last year, Project Rhino successfully dehorned five white rhino in the Somkhanda reserve. Rhino dehorning is a simple process that takes skill and organisation to execute. On-foot trackers follow the footsteps and use their knowledge of rhino behaviour to locate the selected animals whereabouts. Once located, a highly skilled helicopter pilot and vet take to the sky to direct the rhino into a safe and open area before darting the rhino with M-99 a drug cocktail that is 3, 000 times more potent than morphine. 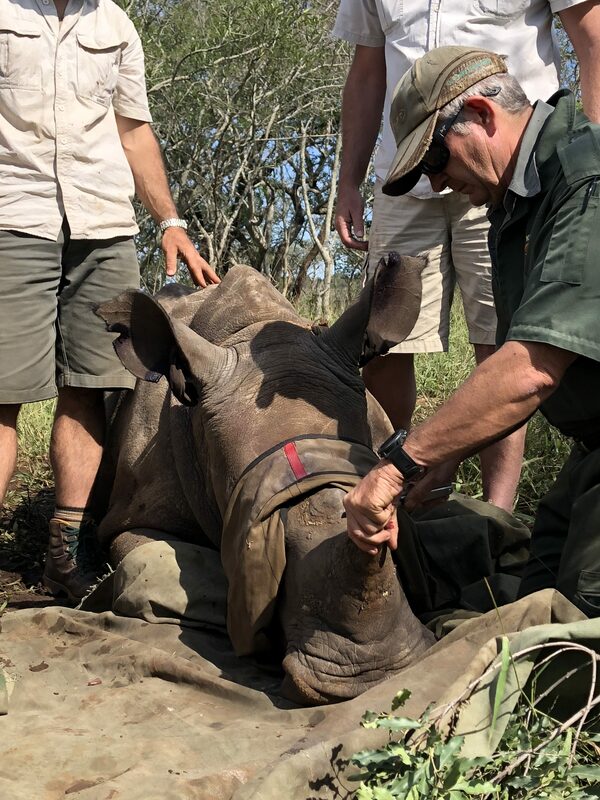 Once the animal is down, the ground team immediately covers the rhino’s ears and eyes and an antibiotic is administered into the dart site. The vet then marks a spot and uses a chainsaw to cut through the horn, which is then shaved down and sterilised. Once the dehorning process is complete, the vet administers a reversal agent, awakening the rhino. 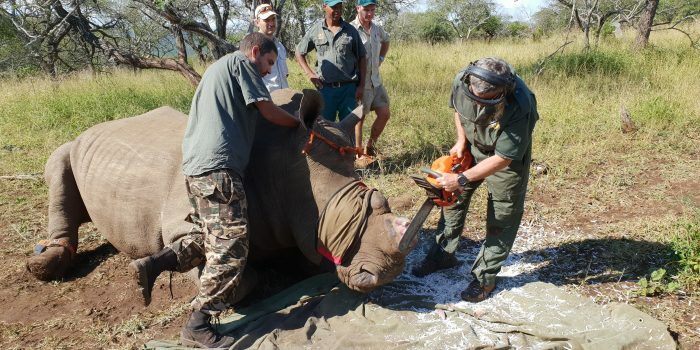 Dr Toft has successfully dehorned nearly 1,800 rhino in the past three years and as a result he has developed an effective method of removing the horn without damaging the rhino’s growth plates. Toft insists that if the process is done correctly it is no more painful than trimming your fingernails. Mike Toft marking the horn before removal. Rhino dehorning presents many challenges, explained Wildlands strategic manager for conservation David Gilroy. “Game capture and working with a megaherbivore in harsh wild conditions in the bush is never easy. It is difficult on machinery and people,” he said. The process is also expensive; costing around £550 per rhino to dehorn with costs being further exacerbated by budget cuts at many rhino reserves in the Kwa-Zulu Natal area. Since the dehorning process started in 2017, reported poaching rates have decreased from 25 per cent to 4.5 per cent in private reserves. 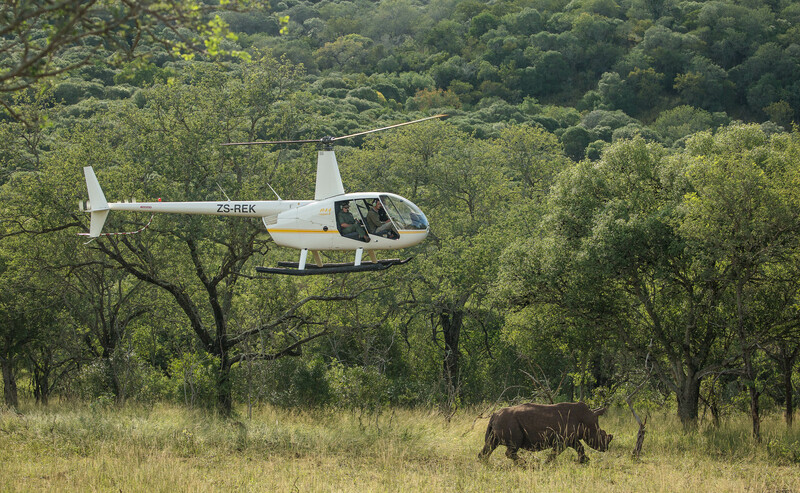 The significant decrease in rhino poaching in KZN is not only a result of dehorning but also the work carried out by ZAP-WING (Zululand Anti-poaching), which provides daily aerial surveillance to 25 nature reserves in the area. Both Gilroy and Galliers emphasised the importance of community and relationships. “We believe relationships with neighbours are critical. We cannot pass problems on to neighbours. Those will eventually become our problems. We try to help one another,” said Gilroy. 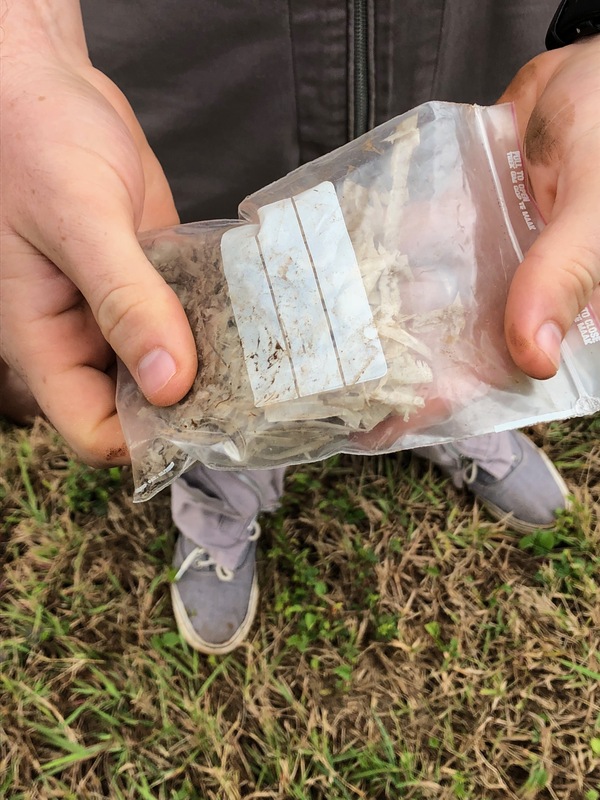 The illegal trade of rhino horn supplies mostly Vietnam and China and is ingested in powder form as a supposed cure to cancer, snakebites, and other diseases. In 2018 South Africa identified rhino poaching as a “national priority crime”. 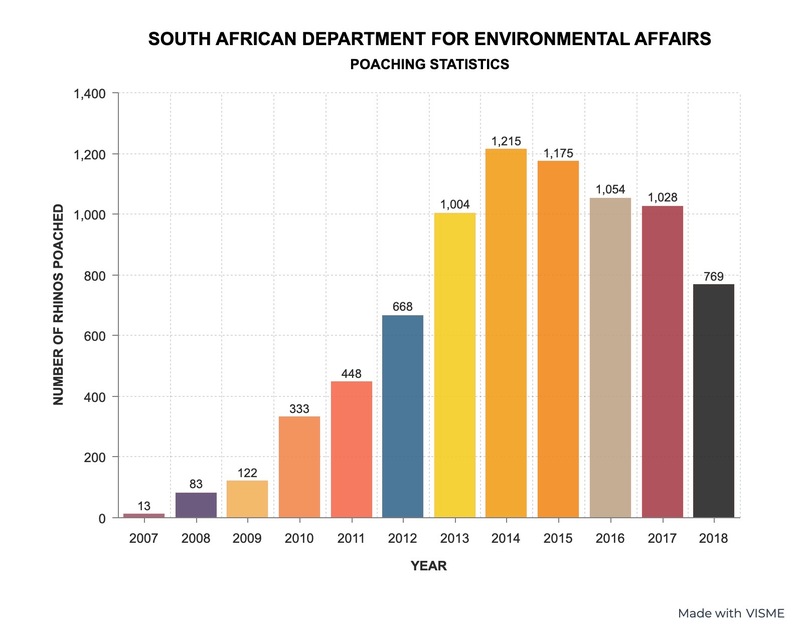 Galliers implied that although this was a positive step in the long-term solution to stop rhino poaching there is still more that could be done. He sees a link between the economic growth of China and the substantial rise in rhino poaching which started in 2009. “One of the things that is interesting is what kicked off rhino poaching around 2009. The instigator was the wealth of China, with that the interest in the demand for rhino horn. As such, it led to being recognised as a status symbol,” said Galliers. In 2018 Project Rhino began engaging with young children from Asian countries, educating them on the importance of rhino conservation. It is hoped that in the years to come, rhinos will no longer need protection. They are a species that originated more than 50 million years ago braving ice ages, giant crocodiles and prehistoric hyenas and without massive, immediate intervention they will cease to exist and we will have only ourselves to blame.